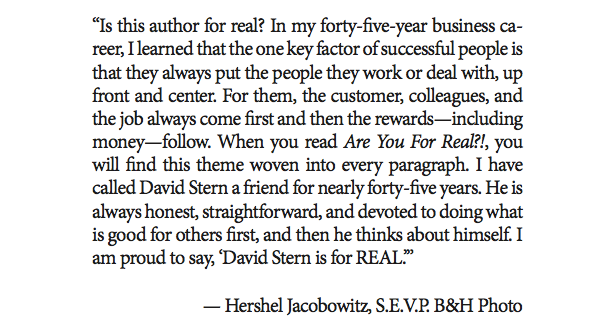 Born to business-owning Holocaust survivor parents, David Stern learned early the value of freedom and how to achieve it through sales. 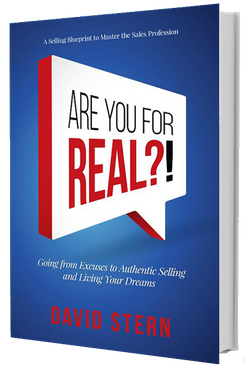 At the heart of his philosophy is the question, Are you for real?, embodying the essence of selling: Be honest, authentic and confident—and put your excuses behind you! In this captivating book, David gets to the nitty-gritty of achieving success, explaining how to reject pretexts, fears and faulty thinking that stand in your way. Sharing his wisdom and sales secrets, he tells humorous and inspiring stories and asks introspective questions to guide you to business and personal fulfillment. No more layoffs, tyrannical bosses, or the 9-to-5 grind. Freedom awaits you. Just say “Yes” to sales and get real. Find perpetual job security and happiness through sales. Develop essential negotiation and decision-making skills. Turn “No’s” into “Yes’s” through persistence. Set realistic short-term goals while focused on the big picture. Plan for success and prepare for the unexpected. Create a work/life balance through proper time management. Regardless of your role in life, you need to constantly sell ideas and beliefs. Whether you’re an assistant promoting your assets to the boss, a manager exhorting employees to strive for excellence, or a consultant trying to close the deal with a prospect, Are you for real?! can dramatically improve your outcomes. Here is what people have to say about Are You For Real? !